especially in live use whith other people on stage or work. Is anything planned on that? And possibly also the option below that. but ... it didn't work for me, with hardware for exemple. am i really stupid ? before you work for nothing. i report as soon as possible. I don't think that anything has been changed about that feature since it was introduced, but go ahead. You can also download SendSX, select the correct input device and try sending the start/stop/pause messages on your hardware; then paste the input SendSX received here. 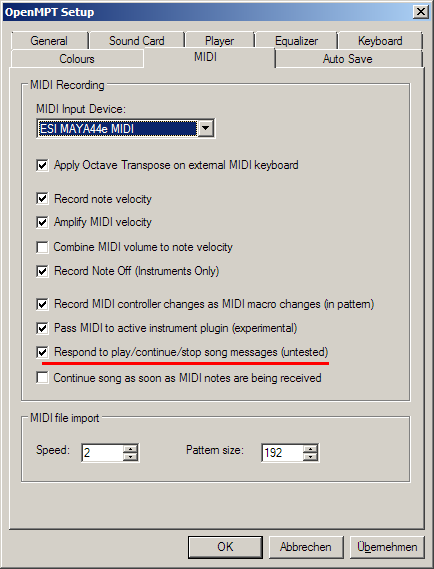 did you check yet which midi messages SendSX receives when starting/stopping? I suppose this request can be closed then?